Arizona's capital city, Phoenix, has risen from the mythical ashes of an ancient agricultural Indian village to become a sprawling modern metropolis and the fifth most populous city in the US. Its rapid urban growth has filled what is known as the 'Valley of the Sun', encompassing the neighbouring towns of Scottsdale, Mesa and Tempe as suburbs, and it is one of America's fastest-growing urban centres, claiming to have more five-star hotels than any other city in the US. With luxurious resorts and spas, glitzy shopping plazas, upmarket restaurants, and superb golf courses, together with over 300 days of sunshine a year, the area has become a popular winter getaway for the rest of the country. However, while some may know Phoenix as a retirement community, it is home to both the University of Phoenix and the University of Arizona, as well as over a dozen other colleges, ensuring a huge student population that keeps Phoenix 'young'. Phoenix has a number of interesting museums, including the Heard Museum of Native American culture and the Phoenix Art Museum. A scattering of parks, a wide variety of restaurants, and a well-developed arts community makes a vacation in Phoenix an attractive prospect for travellers of all ages. 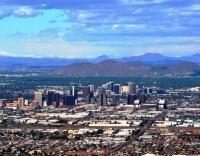 Phoenix's greatest attraction, however, is its location: the city is surrounded by a vast cactus-studded desert and the magnificent scenery of the Red Rock Country around Sedona, whose landscape of canyons, pinnacles, and red cliffs have been the setting for numerous Wild West films and novels. The Apache Trail is a winding scenic drive that passes through some of the beautiful rugged terrain of central Arizona, passing ghost towns, ancient ruins and the Superstitious Mountains.